Young Soft Coral � Cladiella Species: When maintaining a marine aquarium, you must consider the compatibility levels of the inmates of your aquarium. A very aggressive inmate may adversely affect the other inmates of your marine aquarium. You have to be especially particular when it�s a reef aquarium. Many corals are peaceful and are no threat to the other members in the tank while, with an aggressive introduction, you will need to select the other members accordingly. One such aggressive coral is Young Soft Coral, a Cladiella species. Other names: Young Soft Coral is also commonly known as Blushing Coral, Cauliflower Coral, Cladiella Finger Leather Coral, Colt Coral, Young Blushing Finger Leather Coral and Young Finger Leather Coral. Belonging to the Family Alcyoniidae, the scientific name of Young Soft Coral is Cladiella species. Coral type: Young Soft Coral is a type of Leather Coral. Origin or natural range: Young Soft Coral originates from the Indian Ocean and the Pacific Ocean. 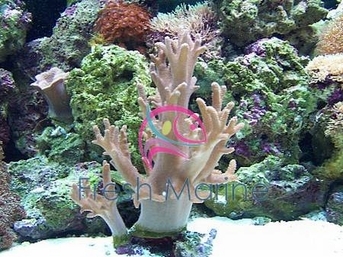 Size: A small Young Soft Coral is 2� to 3� long; a medium one is 3� to 5� long while, a big one is 5� to 7� long. The marine water depth where Young Soft Coral is living, the coral�s surrounding marine environment, the flow of water, etc. considerably affect the size of the Young Soft Coral. Color: Young Soft Coral has a color range of brown, cream and tan. Morphology: The body of Young Soft Coral is generally white or cream colored, spotted with brown or tan polyps on it. The expanded polyps of the Cladiella species yields a bushy look to it while, its contracted polyps give it a lumpy look. The branches of some varieties of Young Soft Coral may be long as a variation. Compatibility: Young Soft Coral is relatively aggressive in comparison to the other marine invertebrates. Breeding: Young Soft Coral breeds relatively easily as compared to the other marine invertebrates. The Cladiella species undergoes fragmentation to multiply. Each fragment produces a new Young Soft Coral. Better still, you can take off one of the coral�s tentacles and fix it on a hard surface such as a live rock in your marine aquarium. This fixing will grow into a new Young Soft Coral. Care: Young Soft Coral requires moderate care because of its aggressive nature.